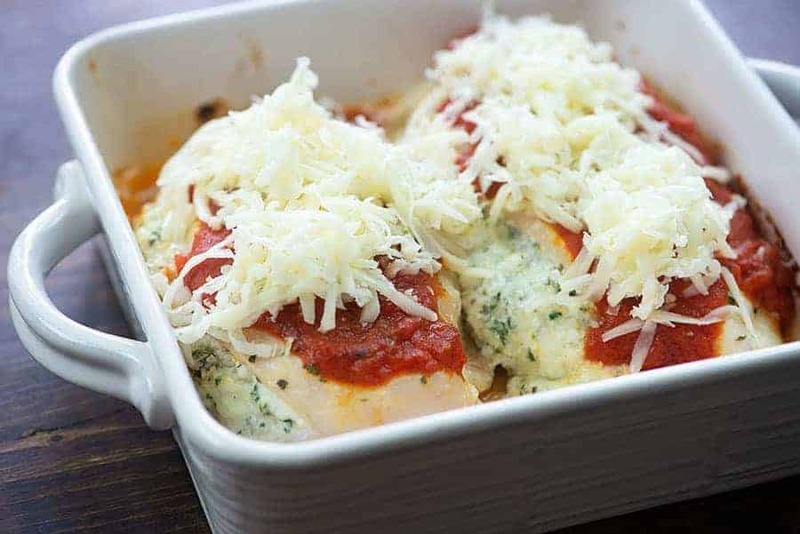 Lasagna stuffed chicken is a tasty way to get your lasagna fix without eating a bunch of carbs! Skip the noodles and stuff your lasagna right inside a chicken breast. Low carb and family friendly, too! My family has been on a major Italian food kick lately. Always wanting chicken Alfredo and spaghetti and lasagna. I don’t mind, because I feel like there are plenty of Italian low carb foods. You’ve just got to get a little creative! Obviously, zucchini noodles make spaghetti night super simple. Chicken Alfredo can be made and served over broccoli instead of pasta. And lasagna? Stuff it in your chicken and skip all carbs! You’re going to love this low carb chicken recipe! First, you’ll want to slice into your chicken using a sharp knife. Place one hand on top of the chicken breast to hold it steady and use the other hand to carefully cut a deep pocket into the side of the chicken. Drizzle chicken with a little olive oil and then season with some Italian seasoning and garlic powder. Next, you’ll want to prepare your filling. 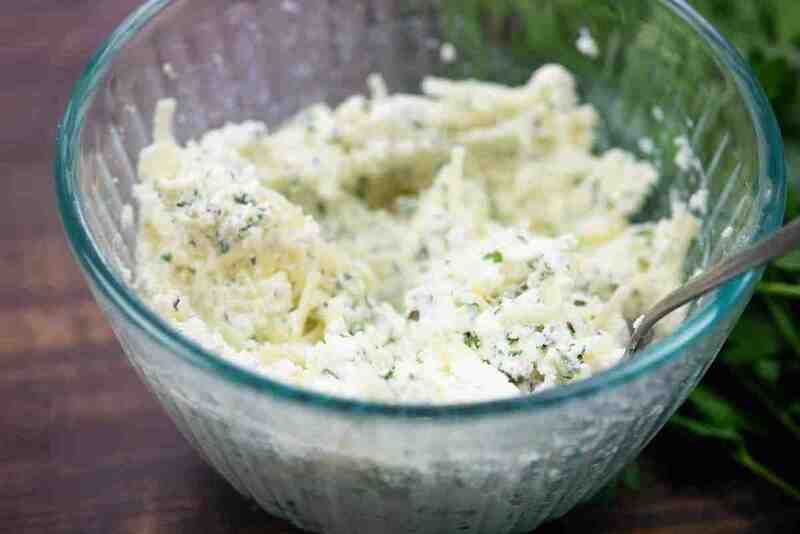 Ricotta, mozzrella, parsley – all of the good stuff from a lasagna is going into this filling. Fill the chicken with the cheese mixture and then spread some marinara on top. I use Rao’s marinara (affiliate link) pretty exclusively these days. It’s the lowest carb marinara I’ve found, but more than that it’s actually the best tasting. I was using Rao’s before I was watching carbs, so I was pretty excited to see that it was also keto friendly. Pop this into a 375 degree oven for about 30 minutes and then pull it out and pile on some mozzarella. Back into the oven for another 5 minutes or until the mozzarella is good and melty and the chicken has cooked through. 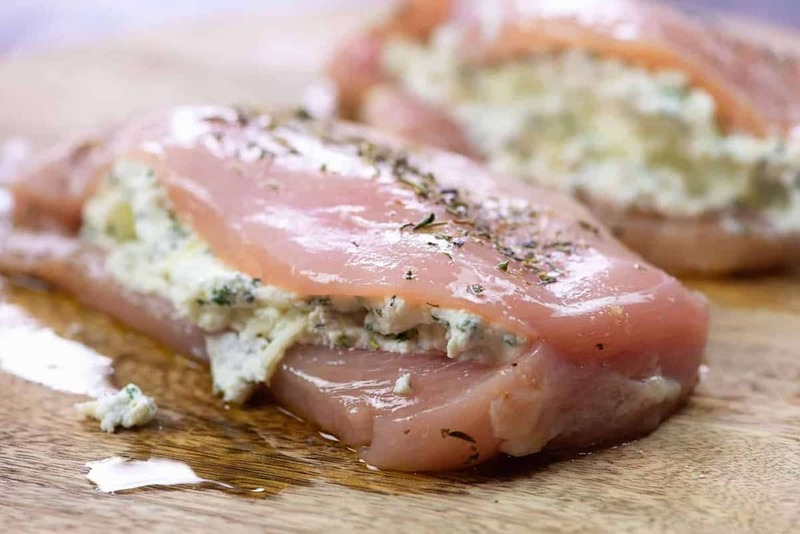 I love healthy stuffed chicken breast recipes like this, don’t you? So easy, so cheesy, and oh man. So good! 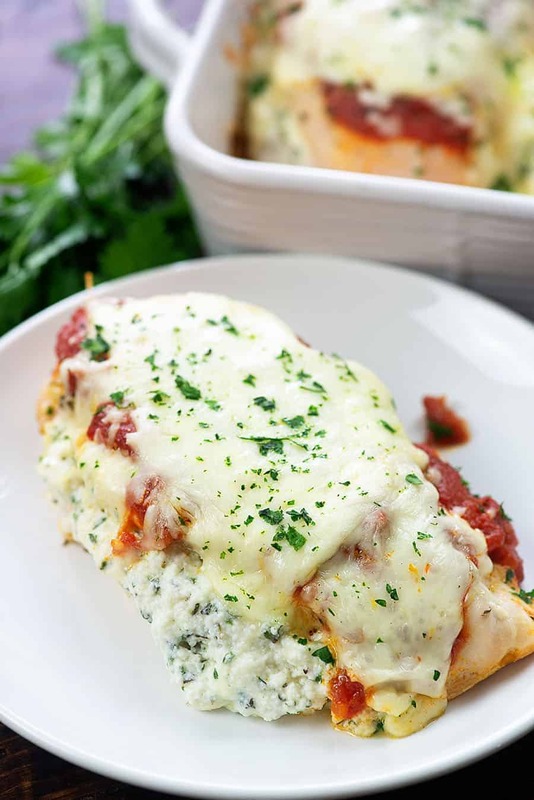 Spinach Stuffed Chicken – This is the most popular recipe on my site and was the inspiration for this lasagna stuffed chicken! Jalapeno Popper Chicken – Wrapped in bacon, stuffed with jalapeno popper filling, and always a hit. This chicken is rich and hearty, so I like to keep my side dishes simple. A side salad with my homemade ranch dressing goes with pretty much everything. Zoodles covered in a little marinara or tossed in garlic butter are a great option. Steamed broccoli goes great with this as well! For dessert, how about some low carb chocolate lasagna? 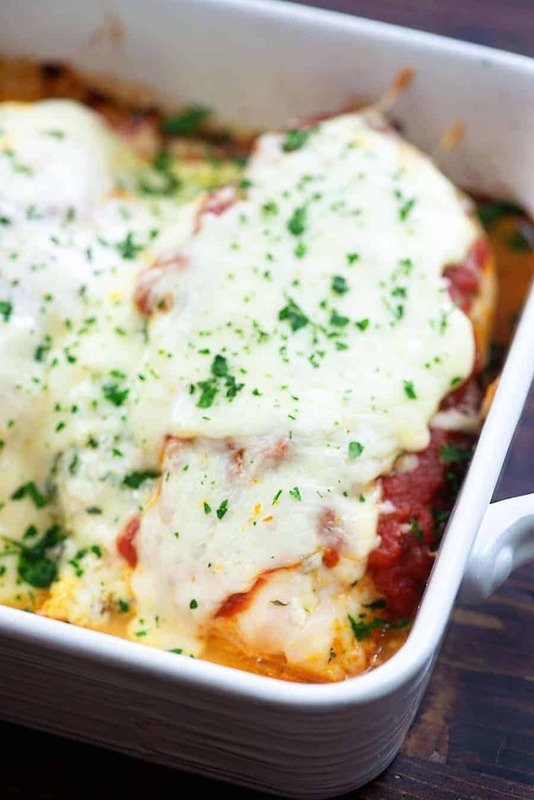 This cheesy chicken recipe tastes like a plate full of lasagna. 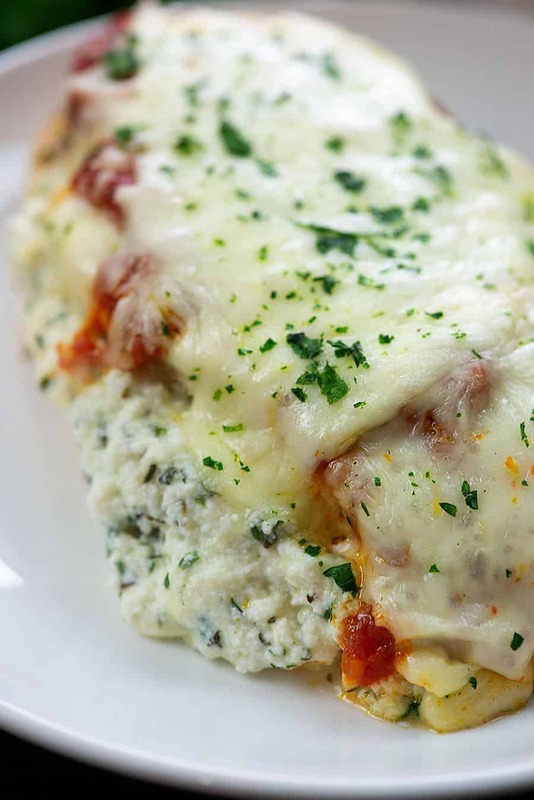 It's stuffed with a mixture of ricotta and mozzarella and topped off with marinara and more cheese. Please note the nutrition information is based on 1 full chicken breast - none of us ate a full chicken breast as this is very filling and rich. Preheat oven to 375 degrees. Spray a 9x13 baking dish with non-stick spray. 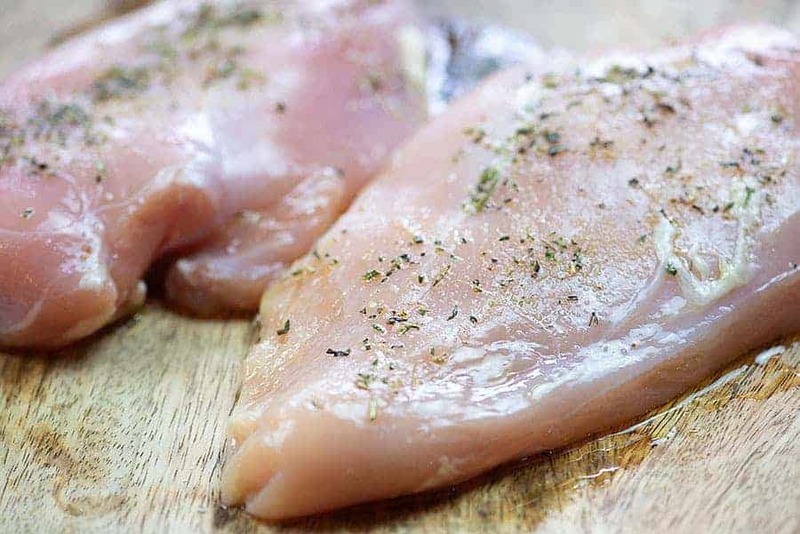 Place the chicken on a cutting board and use a sharp knife to cut a deep pocket into the side of each breast. Drizzle chicken with olive oil and season with 1/2 teaspoon Italian seasoning, garlic powder, and 1/2 teaspoon of salt. Add the ricotta, 1/2 cup of mozzarella, parsley, and remaining 1 teaspoon of Italian seasoning and 1/2 teaspoon of salt to a mixing bowl and stir well to combine. Stuff the ricotta mixture into each chicken breast and place the chicken in the prepared dish. 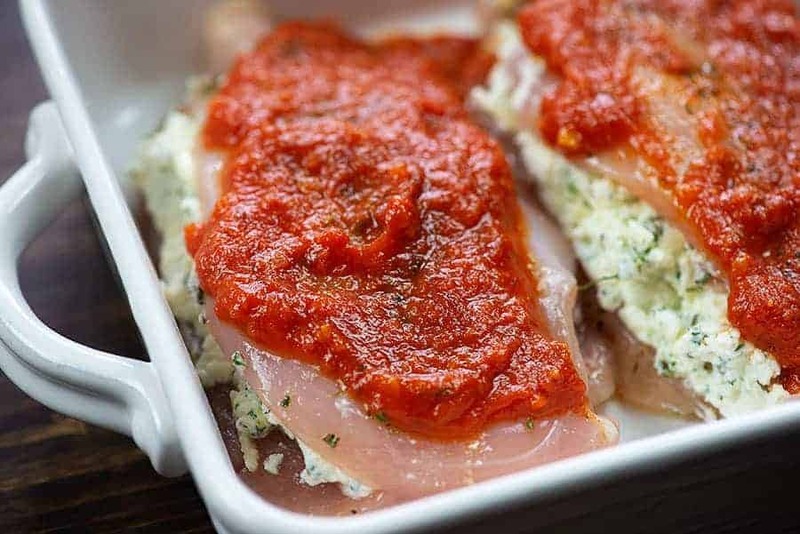 Spoon the marinara evenly over the chicken breasts. Bake for 30 minutes and then sprinkle the remaining 1 cup of mozzarella over the top of the chicken. Continue baking for 5 minutes or until chicken is cooked through. Serve immediately with additional parsley sprinkled on top, if desired. I’m not much on ricotta cheese…. have you ever tried cottage cheese instead? I made this for supper this evening and it was delicious! All 4 of us loved it, which doesn’t usually happen. It was easy to make (I doubled it) and very filling. Thanks for the great recipe! It is very good!!! But my chicken breast were pretty big & it took me about 45 min at 375 degrees to get cooked through. Very yummy though. Used cottage cheese & it was great. 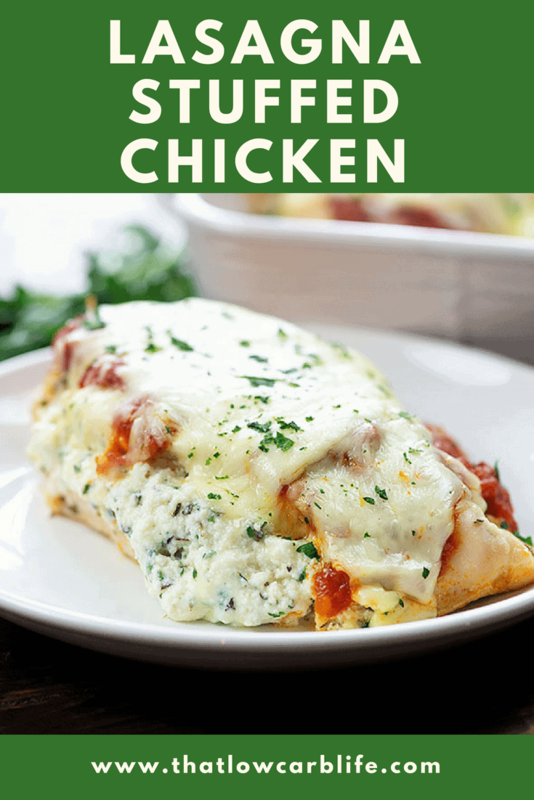 I brought thin sliced chicken breast…….I layered it just like using lasagna noodles and cooked just like the recipe stated. If u buy regular chicken breast…….maybe slice it on a slicer to get it thin …. I say you may get 3 to 4 slices from 1 chicken breasr. I used thighs that is what I had. Worked out great. My husband loved it. It was very tasty but a lot of the filling fell out when cooking. Any suggestions on how to keep the filling in place? Thank you for the great recipe!! Hi! This looks delicious! I’m curious how the macros are so low on this. I put this recipe in Carb Manager and I get double everything (calories, carbs, fat, protein) for 3 servings. Did you mean to say this is really 6 servings? Any clarification would be great! Thanks!!! I used My Fitness Pal based on the exact ingredients I used. It’ll differ based on different calculators/ingredients. How do you stuff thighs? Very good and definitely easy to make. Love how it’s low carb and high protein. Having a husband who is diabetic I’m always looking for recipes that are low carb. Great way to have all the ingredients for lasagna minus the pasta. I added a side of steamed green beans. Perfect dinner! their sides and all was well. 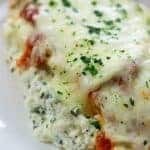 I love it so much that I am having a Keto Italian dinner in April for my dinner club and I will be serving this lasagna chicken. I just need to figure out my sides now! Thank you so much! This was delicious! Thanks for sharing. I am on week 2 of Keto and was looking for new recipes. That was delicious and so easy to make! Thank you.